Although Tokyo no longer ranks as the world’s most expensive city, the stereotype is somehow hard to shake off. The thought of $250 airport to city taxi rides alone is enough to turn off the budget-conscious traveler. The good news is that Tokyo is no longer the ultra expensive city that it once was. Economic stagnation coupled with the weaker Yen have made this city a much more reasonable place for travelers. When I visited last year and again this year, I found Tokyo to be at par, if not more reasonably priced than the capitals of other developed countries. Save for the hefty taxi costs, I found Tokyo to be cheaper than other notable cities in Asia such as Singapore. Hotels in this city are notoriously expensive and a room in a luxury 5-star hotel in Tokyo can easily cost well over $500. The good news is that budget lodging options in the city are aplenty, and not to mention convenient and are of relatively higher quality than elsewhere. For about $19, you can get a bed in a capsule hostel that offers sliding panels for privacy and to block out noise. I stayed in Khaosan Hostel in Asakusa during one of my visits to Tokyo last year and had a great time there. The thing that shocked me about Tokyo when I visited last year after an 8 year absence was the proliferation of cheap food – served in comfy sit-down restaurants – around the city. For about $4 or $5, I could get a piping hot bowl of ramen and sometimes even with some gyoza (Japanese dumplings) on the side. 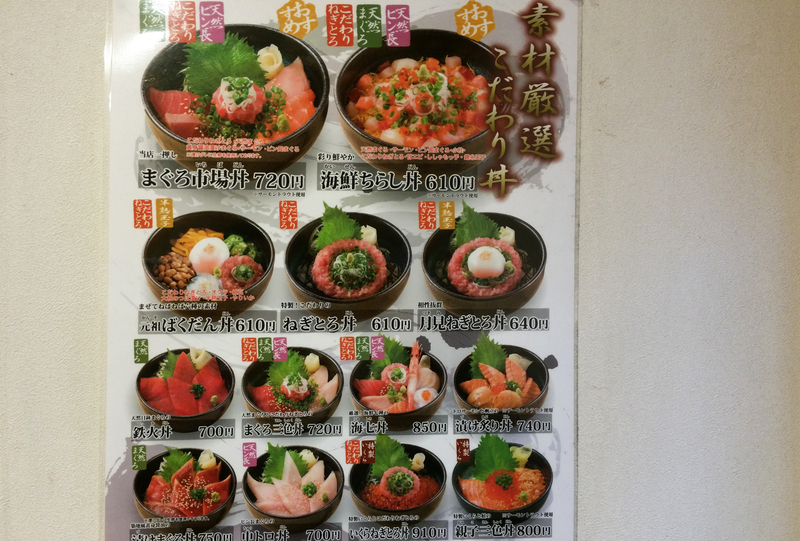 My personal favorite among these cheap eateries is Maguro Ichiba which specializes in chirashi or rice bowls topped with various kinds of sashimi. During my last visit to Tokyo, I ate there 3 times! Of course food in Tokyo can be expensive as well, if you choose to go to one of the many fine-dining restaurants scattered about the city. But there definitely is no shortage of cheap options. You can’t miss them. To find out the good ones, just follow the salarymen in business suits as they venture to their favorite eatery during lunch break. Tokyo’s highly developed metro and rail system may be hard to understand at first but is actually quite intuitive once you get the hang of it. There are easily hundreds of stations that cover Tokyo alone, involving both government and private rail lines. While apps such as Google Maps give very detailed guides in going from point A to B, knowledge of the various lines may actually save one a few bucks. The key to commuting in Tokyo is to stick with a consistent line or company. Sometimes, a trip may involve transferring to a totally different line owned by another company which may save you a few meters of walking but actually double the train fare so be wary of that. Airport to city transport: If you’re coming from Narita airport, it may be worthwhile to get a Suica & N’EX combo ticket for 3,500 yen. This includes a Narita Express train ride (an airport train ride alone already costs 2,940 yen) as well as a 2,000 yen Suica credit. Admission fees to some of Tokyo’s major tourist sights can cost an arm and a leg! A ride up to the observation deck of Tokyo Tower alone could set you back by as much as $20. As a tip, I would suggest avoiding going to Tokyo Tower or the Tokyo Skytree. There’s no doubt these landmarks make the city skyline special, but these high rises are better appreciated from afar rather than onsite. Sensoji Temple (FREE) – one of Tokyo’s most iconic sights, totally free. Located in atmospheric Asakusa. It’s typically very crowded in the day but a visit in the evenings reveals a very pleasant sight, with floodlights and all. Tsukiji Fish Market (FREE) – you may need to pre-arrange your visit but again, it’s free. Most people come here to taste the fresh sushi but it’s also popular among tourists who want to see how the fish and various seafoods are brought to the market to sell. Rainbow Bridge and Statue of Liberty replica (FREE) – you can cross this scenic bridge to Odaiba if you don’t mind smelling car fumes. Over at the Odaiba side, a replica statue makes a nice contrast to the bridge especially at sunset. Shijunku Gyoen (admission: JPY 200) – an expansive garden which is a popular viewing spot during Cherry Blossom and Autumn seasons. The Japanese Gardens here is among the best in Tokyo. Rikugien (admission: JPY 300) – another popular garden in Tokyo. It’s one of the best places to visit during autumn for the change in colors (called koyo in Japanese). Best Viewing Decks in Tokyo – you may check out this post on a recommended one day trip around Tokyo. If you’re visiting during autumn, you may also want to check out my recommended autumn viewing spots in Tokyo. Many people also come to Tokyo to experience the unique Japanese-style urbanity which doesn’t require visiting a single temple or palace or monument. A must when in Tokyo is a stroll down the Ginza or Shibuya for that iconic rush hour experience, again totally free. A jaunt to Harajuku during the weekends will allow you to rub shoulders with youngsters who seem to jump out from the pages of an anime comic while a stroll down Marunouchi in the morning may reveal the fast paced and no-nonsense discipline of local office workers. Got any money-saving tip for Tokyo? Let’s hear them! Citi MaxiGain Savings Account – Is It Worth Signing Up For? This post is very timely. Very helpful as I’m currently making an itinerary for my trip next month. Great to know it helps! Enjoy your trip to Japan, Darwin!